At Gomm Stained Glass, we concentrate on 2 things. Stained Glass Is Great And We Want To Share! 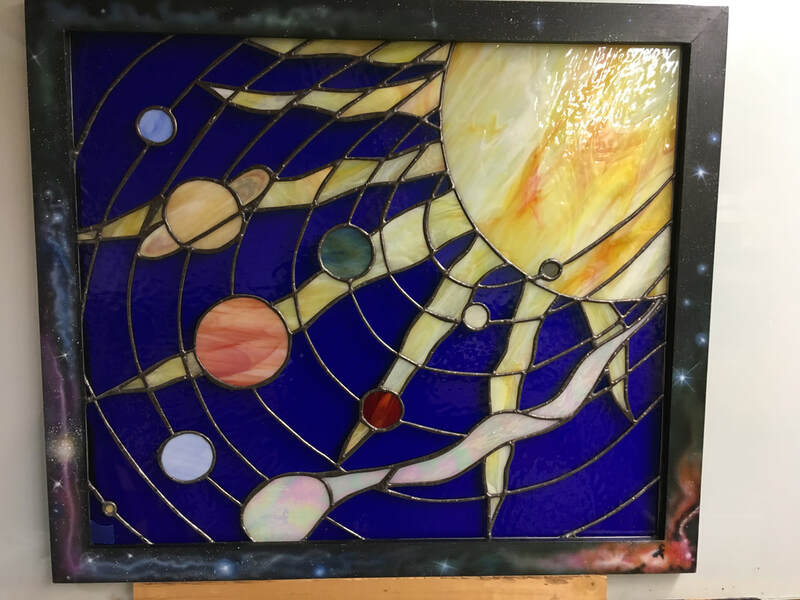 At Gomm Stained Glass, LLC (www.gsg-art.com) (was gsg-glass.com) we build and ship Custom Stained Glass for homes and businesses across the U.S. Recent projects include a front entry inspired by the 1908 work of Greene & Greene (famous for their oriental inspired bungalow architecture), Front door panels and room divider panels for a ski lodge in Park City, Larry Millers' cabin in Idaho, and Keith Bartons' home in Alpine. We also shipped a large sign to the Knob Gallery in Wisconsin and one of the Women of Faith panels to Florida. We created a YouTube video of a recent install of "The Dance Of Life." and we installed about 85 square feet in a grand entry in Salt Lake City. Jeanne entered a competition for the Smiths Marketplace in Springville. Her entry won and we got to build a 5 foot by 12 foot mosaic panel. Click here for the install video. It took 2 to 3 months to build the panel, but only took a little over 16 minutes to install. The panels are up, now we need to fill the gaps! ​..take at look at the video where we talk about it. Click Here. Sometimes we're called upon to make beautiful bugs! Jeanne Shot This Cute (Short) Video The Other Night In Class When She Noticed All The Students Were Tapping Glass At The Same Time, It's Almost Musical! Turn Up The Volume! We are working away on our on-line stained glass classes. They are an exceptional value. Click here to go to our online classes. she has excellent color sense and imagination. ​making sure lines are straight and the design will fit.